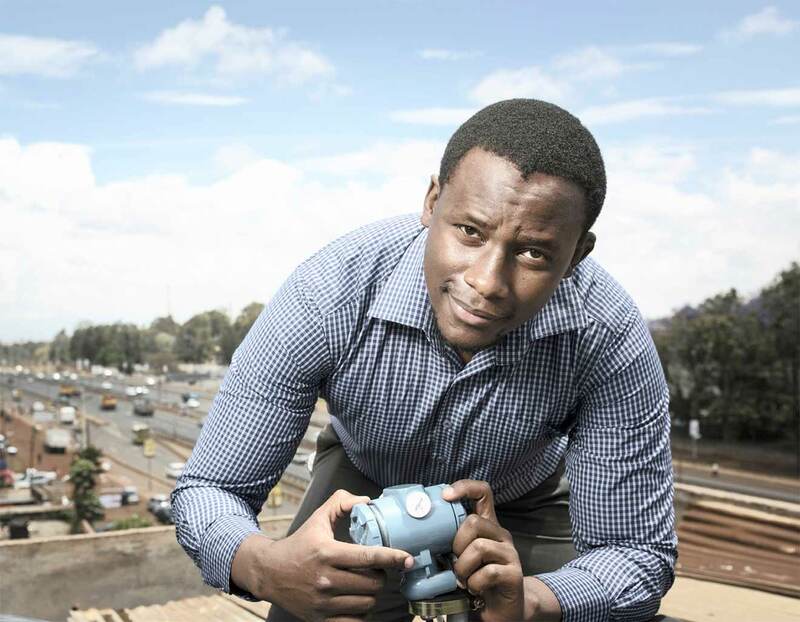 Meet Kelvin Gacheru, an innovator of a smart solar-powered monitoring system seeking to solve water scarcity and champion clean and reliable water. Water is a basic human need, but for millions of Africans, it remains a luxury far out of their reach. With the growth of urbanization and water scarcity in Kenya, innovators on water solution have become a much-needed key for households and businesses. Kelvin Gacheru is a man on a journey to make water available in the region. The water resource engineer notes that 40 per cent of urban and 60 per cent of rural residents lack access to a safe and reliable water source. To this end, he has designed a water management system that enables water reservoir owners to monitor and control the water levels in their tanks from any location using their mobile phone. His quest began when he was working as a water engineer while managing three projects in different counties in Kenya. “One of the biggest challenges in managing this project was monitoring and assessing how effective and efficient the projects were. The only way I could ascertain if they were functional and had available water was to make site visits to the projects which were cumbersome and expensive,” he says. He then inquired about the availability of water monitoring systems, “most were imported and internet-based which made them expensive and non-functional especially in rural areas where internet access was a challenge,” he explains. With these unpleasant encounters, he saw a niche and decided to develop their flagship product ‘Mobi-Water’, an affordable monitoring solution. For Gacheru, starting out was the difficult part, especially when dealing with hardware products. The service, Mobi-Water is a simple solution, where a sensor is installed in tanks, which then reads the water level and sends information directly to your mobile phone as an SMS, and alternatively, it can be viewed using Mobi-Water App for smartphone users. When water levels drop below a certain point, the platform sends a text message alert to up to 10 mobile numbers. The system can also be set to send timed SMS reports on water levels at specific hours or intervals throughout the day. “Once installed, the data we get from our systems helps us add value to the current water service delivery models making them more efficient and improve water consistency as users can remotely open and close valves and pumps if they want to refill the tank or redirect the water,” he explains. The firm has had a very good progressive growth; Gacheru however, says that it is never easy introducing a new product into the market, especially as a start-up company. He says that his experience in implementing community projects and increasing access to water is what drives him, sighting that he believes that Mobi-Water can change the way people access and manage their water. “We have been receiving a lot of encouragement and support from the various local institutions. We have piloted the system in a few local restaurants and homes and recently began a project to install the Mobi-Water system in 100 Community Water Points under a Dutch-program dubbed the VIA Water Program,” he narrates. The innovator reveals that they plan to do a lot of Direct Marketing and Demos to target B2B clients and looking at incorporating Social Media Marketing. While starting out, Gacheru points out that capital was a major challenge as it is with most start-ups. “What we did was we drew up a plan with specific milestones and bootstrapped on a very lean budget. Through time we were able to prove our prototype and our model could work,” he says. “Our goal” he notes, “Is to be the largest Private Water Service Provider in Africa by providing solutions that not only improve the way people manage their water but also providing value-added services for people to access consistent water supply,” Gacheru says. He has since been shortlisted for the Royal Academy of Engineering Africa Prize for Engineering Innovation that took place on last year in Nairobi. The award encourages talented sub-Saharan African engineers, from all disciplines, to develop local solutions to challenges in their communities. “Being shortlisted and a Finalist at the Africa Prize for Engineering Innovation came at the right time for us, we had just finished making our first prototype and testing it out,” he says. The Africa Prize provided them with six months of intensive Business training and mentorship that enabled them to both refine their Business model and improve on technical aspects of their product. Furthermore, he says it has also exposed him to various opportunities and interactions with global investors. “As engineers, we tend to focus on the technical aspects and overlook aspects such as the commercial viability of our products. I am grateful to the Royal Academy of engineering that through the Africa Prize they have been able to develop local solutions to challenges in their communities,” he notes. To Gacheru, a successful entrepreneur needs sheer determination and discipline with a clear picture of what they want to achieve, and then put everything into it without looking back. “The entrepreneurial journey is quite difficult, with lots of failures and disappointment. The ability to learn from these failures, and still be determined enough to work towards your goal is what will lead to success,” he points out. With a team of four, Kelvin Gacheru is confident that they will grow and spread across the country as they intensify their operations over the coming months.